In addition to the general RNIB helpline we provide a free information service. This UK service offers information on relevant to sight difficulties for people with a learning disability and other complex needs such as dementia/stroke/autism. 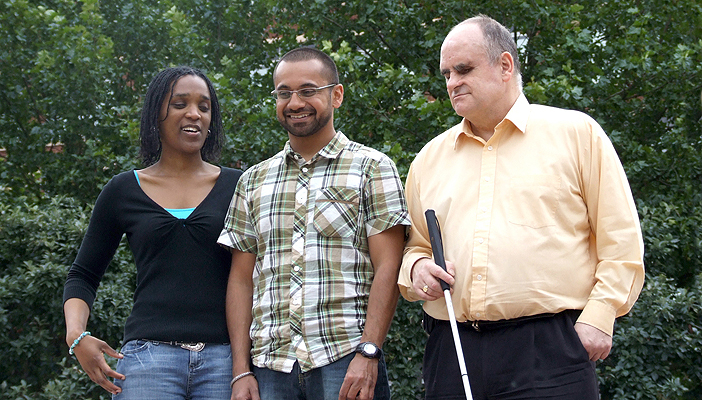 RNIB UK Vision, Learning Disability and Complex Needs Services offers free, impartial information. Visual Impairment such as needing spectacles or sight impairment including blindness, is more common amongst people with a learning disability or intellectual disability, including people with complex needs such as brain injury and dementia. The information may help the person, the parent or carer of the person or people that provide services within the learning disability or visual impairment community. Below are some examples of questions we are regularly asked. If we can help you please contact us directly. "My mother, who has dementia and suffered a stroke that has affected her ability to speak, has never had an eye exam. Is it worth her having an eye exam"? "What leisure activities are available for my adult son who has Down's syndrome?" "We are a social care provider and support people with learning disabilities. We require training on how to provide support for our service users in everyday life, manage frustration that could lead to self-harming, and how to create and maintain a safe environment." "Do you have details of any optometrists in the area who would be able to do eye exams for these residents of a day centre?" "I think my daughter who has autism can't see and should be registered blind, what should I do?"